(Deborah Wall) Artist Roy Purcell’s murals are found in a canyon at the base of the Cerbat Mountains near Chloride, Arizona. (Deborah Wall) This panel from Roy Purcell's murals near Chloride, Arizona, depicts the Tennessee Mine, which operated in the area until 1947. (Deborah Wall) Roy Purcell painted the murals in 1966, labeled “The Journey: Images From an Inward Search for Self” near Chloride, Arizona. Chloride is different from most other former mining towns in our region. Its biggest mine, the Tennessee, closed in 1947. Thereafter, Chloride became neither a ghost town nor a big tourist destination, but a place where people live. Fewer than 300 remain, but those seem to highly respect individualism and creativity. Visitors are welcome to observe those values, while strolling around town taking in yard art, historic buildings such as the old jail and fire station, and shops full of antiques and handmade crafts. Chloride is compact, and therefore easy to walk. Chloride is said to be the oldest continuously occupied mining town in Arizona. Prospectors found riches here as early as the 1840s; serious mining commenced in the 1870s. Population declined in the 20th century. For many years Chloride was the home of Ray Chesson, a beloved writer whose typewriter made Titans of desert rats and other interesting oddballs. 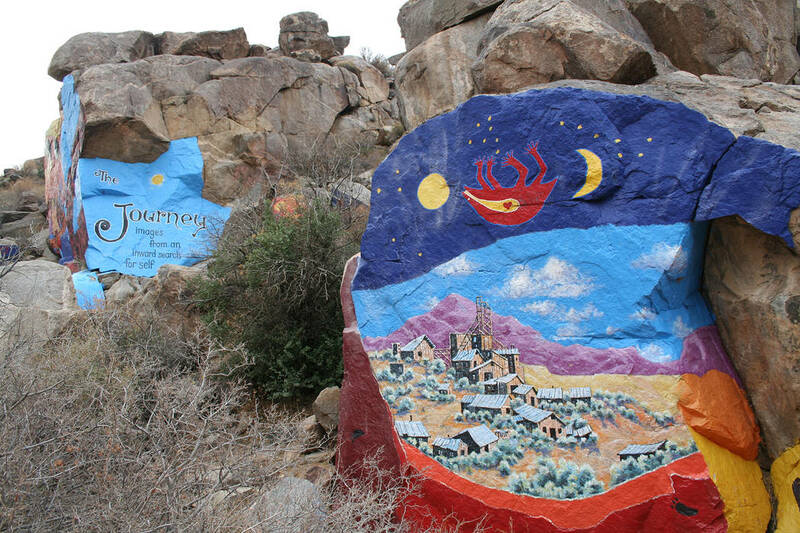 The town is best known for what some call the Chloride Murals, in a small canyon, a couple of miles outside of town, at the base of the Cerbat Mountains. The murals depict a benign-looking goddess and also the Tennessee Mine under attack by some supernatural being. 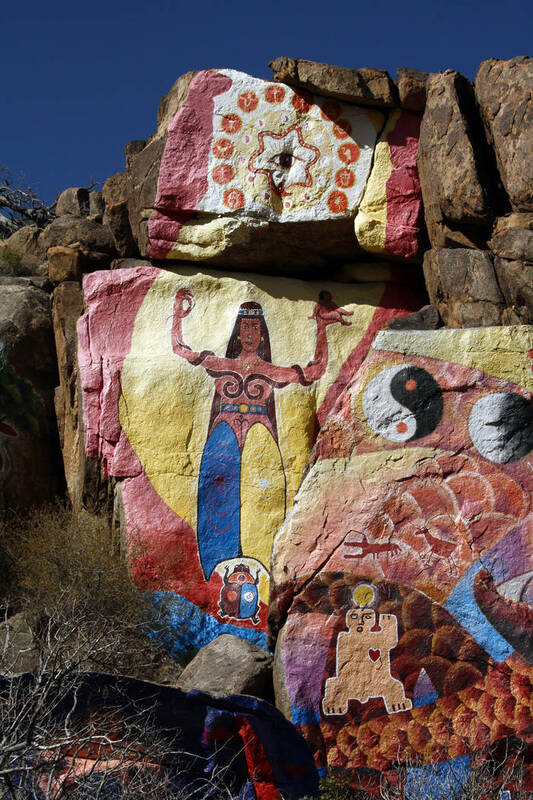 They were painted by Roy Purcell in 1966 on 2,000 square feet of granite boulders and cliff faces. To fully understand the complex and somewhat bizarre murals you would have to get into the head of Purcell more than 50 years ago. They are labeled, “The Journey: Images From an Inward Search for Self.” Purcell did tell me, though, that you need to read them from right to left. Understanding or not, most people will find the images beautifully painted and their eye-popping colors pleasing. This modern rock art has kept its vibrant hues due to Purcell retouching them in 1975, and again in 2006 to celebrate his 70th birthday. He chose the location, perhaps, to honor American Indian rock art — petroglyphs – which were carved centuries ago in the desert varnish coating boulders on the other side of this canyon. Both forms of rock art, the prehistoric and the new, are worth pondering on your visit. Allow about one-half day to see the murals, town, shops and have lunch at Yesterday’s Restaurant. A map of the town, for a self-guided walking tour, can be picked up at the Mineshaft Market, 4940 Tennessee Ave.
Be sure to wear comfortable walking shoes and bring an extra layer of clothing. 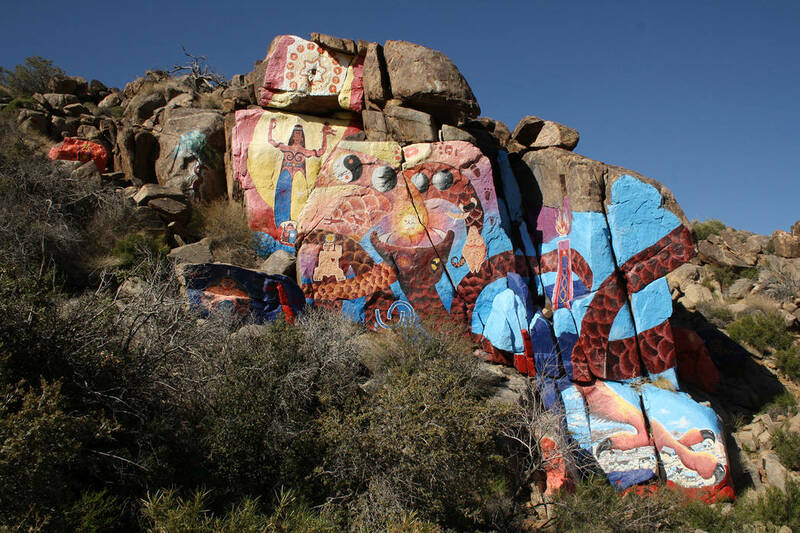 At the murals’ 4,500-foot elevation, it could be 10-15 degrees cooler than the Las Vegas area. From Boulder City, take U.S. Highway 93 south over the Hoover Dam Bypass into Arizona as if going to Kingman. Drive 53 miles and go left on Mohave County Highway 125. Drive 3.7 miles to the center of Chloride. To the murals: From the center of town drive up Tennessee Avenue for about one-half mile until it turns to gravel. You can park here and walk, or if you have a four-wheel-drive vehicle you can continue driving. After you cross the rocky, usually dry wash, you’ll need to stay right at the fork. After about one mile, stay left at another fork. About 50 yards farther look for the parking pullout on the right and park here. Head on foot about a quarter mile to the murals on your right.